← Going to Dayton? Visit Ears to Our World’s booth–and meet us! Taken at the Kenwood booth the day before the Hamvention 2012. 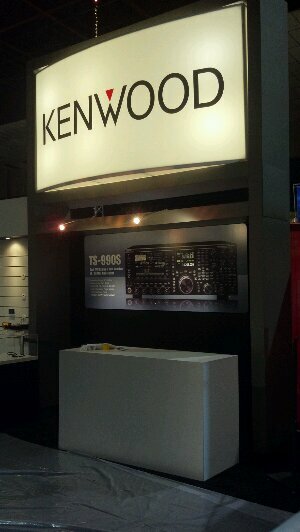 I just walked past the Kenwood booth where they’ve prepared a place for the TS-990S. I have a feeling it’s going to be very busy here tomorrow morning. I will fight my way through the crowds and grab a few photos of the real thing. Check back here tomorrow! This entry was posted in Announcements, Conferences, Events, News, Product Announcements and tagged Dayton, Dayton 2012, Dayton Hamvention, Kenwood TS-990S, TS-990S, ts-990s photos. Bookmark the permalink.